The diversity on indigenous livestock breeds and cultivated plants, the agrobiodiversity, is a treasure for our food and agriculture today and for the future. Many characteristics make the animals and plants well adapted to their local environment, to harsh conditions like dry summers, cold winters, wet soils or stony grounds. This diversity needs to be protected and conserved to be able to react to the changing conditions of our environment like climate change and new needs for nutrition. But in difference to nature protection agrobiodiversity need to be used, eaten and set into value to survive. Therefore SAVE Foundation has developed the marketing concept Heritaste® for indigenous livestock breeds and cultivated plants. This agrobiodiversity need to be conserved alive on farms and in that surroundings they were developed from our ancestors over centuries adapted to the particular environmental conditions. This diversity need to be in gardens and on farms, in the hands of people who know how to raise or grow them and understand the unique qualities of each breed and variety. Reproduction needs to take place on a yearly basis so that changes can occur with each generation in response to changes in climate and other environmental factors. The best way to ensure that professional farmers, hobby farmers and gardeners continue to keep these breeds and varieties is to encourage their use and increase their economic value for a long-term sustainable conservation. Depending on the breed or variety, this may mean through: milk and milk products; meat and meat products; grazing; therapy; juices, jams and other preserves; leather goods; rugs; alcoholic beverages; medicinal herbs; bed and breakfast on the farm – the list is as diverse as the genetic resources! Heritaste® is a Europeanwide registered trademark. The Label makes products and services of indigenous cultivated plants and livestock visible for the public. 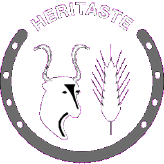 The Heritaste® label is a feature to aid wider recognition for agrobiodiversity products throughout Europe. Thus, it has a benefit and impact for all producers of high-quality, agrobiodiversity products and also for consumers: By purchasing these products the consumer can make a direct contribution to sustainable conservation of agrobiodiversity. The protected trademark Heritaste® supports products from old breeds and varieties and is to become a Europe-wide re-identification feature of agrobiodiversity. Heritaste® starts in 2017 with pilot producers of the" Archeregion Flusslandschaft Elbe" www.arche-region-elbe.de in Germany.